Homeschooling can be immensely rewarding for kids and parents. But if you’re huddled together in a cramped and cluttered corner of your dining room or have to move books and supplies off the kitchen table multiple times a day for meals – not so much. You don’t have to replicate a traditional school classroom to teach your child yourself. But modifying your home to create a peaceful and inspiring environment can pay huge dividends in terms of productivity and learning. This is especially true if your child has special needs or requires a lot of encouragement to learn. Here are some tips to create a homeschooling environment where you and your child will thrive. Whether you’re modifying an existing space, adding onto your home, or building a new house from scratch, there are some structural features that can make your homeschool classroom a better environment for learning. Large space. Be sure to give yourself enough room. An 8’x10’ bedroom is not big enough to fit desks, bookshelves, learning centers, open floor space, and the other things you’re going to want. Shoot for at least double that size and try to make it open enough to walk around in. Comfortable climate. Basements and garages can work as homeschool classrooms if they’re well insulated. But your kids may have a hard time learning if it’s too hot, too cold, or damp and stuffy. If you’re modifying one of these spaces, make sure it’s comfortable year round. Windows for natural light. Light and bright spaces are generally better for learning and creativity. However, it’s a good idea to install blinds or shades if you get direct sunlight during the day. Otherwise, you might find yourself uncomfortably hot every afternoon. Good artificial light. During the evening or on overcast days, you will want good overhead lighting to keep everyone’s spirits bright. Spill-proof flooring. In all likelihood, reading and math won’t pose too big a threat to your floors but science and art can be another story entirely. Spill-proof flooring like wood, tile, or laminate is much better-suited to homeschool spaces than wall-to-wall carpet. Lots of color. You don’t need to paint your walls like a Crayola box to have a colorful and inspiring classroom. Colors can be on storage bins, throw pillows, artwork, maps, manipulatives, and more. But be sure your classroom has a bright and cheery vibe. Many homeschoolers find that painting walls a soothing color creates a calm and nurturing atmosphere. Wall space for a whiteboard, art displays, and posters. You can make do with easels in a pinch, but wall space is really useful for a home classroom. Your children will enjoy seeing their work displayed. You can rotate spelling words, inspirational quotes, and educational posters. And a whiteboard can be really useful for working out problems and illustrating concepts. Instead of buying one, consider painting a wall with chalkboard or whiteboard paint. Everyone will get a kick out of writing directly on the wall and not getting in trouble for it. Outdoor learning spot. One of the advantages of homeschooling is the ability to learn outside when the weather is nice. Create a relaxing outdoor spot for reading, and perhaps a set up a table and chairs for schoolwork. When choosing outdoor furniture, avoid tables with holes (ex. metal mesh, or slatted wood). These are harder to write on. Garden patch. Creating a vegetable garden is a great way to teach life lessons and patience, see science in action, and get outdoors. Getting to eat your homework is an added bonus. If you don’t already have a sunny spot with fertile soil and good drainage, it’s not hard to create. You can rent a mini-excavator and knock it out in an afternoon. If you’re really ambitious, you can build a greenhouse that can keep your thumb green all year long. The physical environment and sound impacts how the brain processes data. Here are some things to incorporate as you start outfitting and equipping your homeschooling space. A place for everything. Keeping your classroom clean and tidy is important for learning and productivity. Be sure to incorporate lots of storage and organization to keep clutter to a minimum. Make sweeping floors and wiping down surfaces a group activity to catchy music at the end of each day. Tables and chairs – Whether it’s a large communal table or individual desks, each child should have a dedicated workspace. Be sure it’s big enough so everyone can spread out books and papers. Wheeled chairs are great for kinesthetic learners. A computer station. Modern homeschooling generally includes technology, but you want to control its use. The best approach is to create a computer station that is accessible but separate from where “unplugged” work takes place. Alternative seating. If you have a restless learner, yoga balls, bean bags, and other types of alternative seating might help absorb some of that energy and focus attention on the task at hand. Bookcases. Bookcases are a must in nearly every homeschool classroom. They come in an endless variety of shapes and sizes, but many homeschoolers find that low, waist-height bookshelves work best. Workbooks and supplies are always within reach and you can use the top surfaces to display crafts or set up learning centers for different activities. A rug and throw pillows. You can soften your classroom and create a space for lying down and reading by adding a rug and some large pillows. Baskets or bins for supplies. Once you start using baskets and bins for your supplies, you will never go back. These are a must for craft supplies, manipulatives, workbooks, musical instruments, and just about everything else you might have. Use labels to make it easy for little ones to help clean up. Soft music. Studies show that classical and movie music stimulate brain activity so that your student can focus. Get creative with this. Gregorian chants vibrate through a room and instill quiet, meditative thoughts without disrupting the studying process. You can create a positive learning experience by tracking progress in fun ways and managing the noise level around the work stations where you teach. Use incentives. Reward sticker charts work wonders with kids under 10. Completing a poster or graph to show progress toward a goal is fun for any human. For teens, try attaching performance to tech time on their phones and gadgets. That way, they have an immediate incentive to do well and work hard, especially if they don’t want to lose their connection to the rest of the world. Put personal electronics out of reach. Tablets, computers, smartphones, and other gadgets can be extremely distracting. Unless your child is doing an online lesson or needs it for research, keep electronic devices out of the “temptation zone.” They should be far enough away that your child can’t reach out to grab them. Use technology strategically. When you need tech for an assignment or for emergency purposes, limit the time and state a specific objective so your child has a clear goal and finishes quickly. For research, allow 30 minutes and ask for a write-up of their results from up to three cited sources. Read outside. Sitting on hard chairs in an enclosed space can drive anyone bonkers and isn’t conducive to learning. So, when the weather is good, take a few lessons outside or let your child choose where to do their reading. Certain work can be done virtually anywhere. Sit at a picnic table for lunch or build comfortable workstations in areas with lots of sunlight. After all, one of the most challenging things about traditional classrooms is the never-changing surroundings that fail to inspire public school students. Keep the bedroom off limits. Teenagers might want to work in their rooms, but this is not a great idea. There are too many distractions, including the bed. Also, many people believe the bedroom should be treated as an oasis, a sanctuary that is stress-free, which is a long way from cramming for tests and doing challenging assignments. Take lots of short breaks. Give yourself and your student a break. Take time out for snacks, active playtime and mental breaks. Schedule the breaks after more rigorous tasks or between before a subject your student doesn’t like. If you work with your child, you’ll find a flow that works for everyone. Suggestion: spend 20 or 30 minutes on a task, then a five to eight-minute break. This is really important for learners with disabilities or other challenges. If your student is able to clear their mind, retention is bound to be higher too. All children want to know they are loved. Kids with special needs need it even more. Homeschooling lets you show your kids how proud you are with hugs, kisses, and one-on-one attention. These are things they can never get through a traditional public school education. 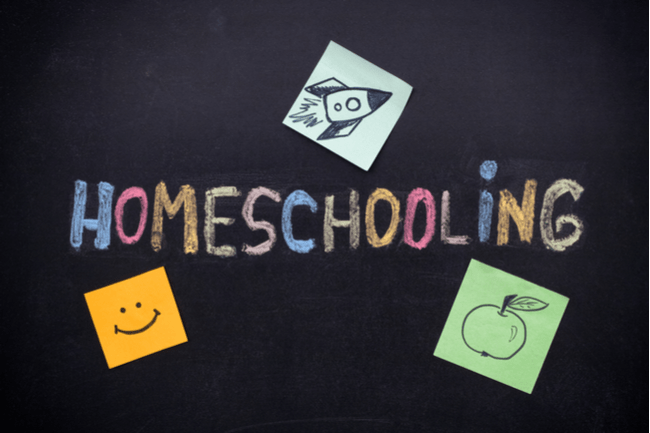 You can have a profound impact on your child’s learning and accomplishments through homeschooling. If your child craves art, music or other subjects cut or reduced from public schools, you can provide some of that at home. Having a mental or physical disability is a struggle. When you teach your child at home, you can reinforce feelings of worth and achievement to counteract that.